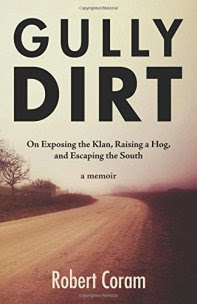 Attached herewith is Chet Richards’ elegantly written and highly entertaining review of Robert Coram’s latest book, a personal coming of age memoir, Gully Dirt: On Exposing the Klan, Raising a Hog, and Escaping the South. I have known Chet since 1977, and he is one of my dearest friends as well as a close colleague. Chet has a PhD in Mathematics and is a protégé of the late Colonel John Boyd, the subject of Robert Coram’s, Boyd: The Fighter Pilot Who Changed the Art of War. But Chet also has his hidden sides. One of the lesser known dimensions of Chet’s intellect is that he is a perceptive student of culture — he once held my wife and me in dazed silence for about 45 minutes as he described the vagaries of the now forgotten royal court of Poland. Chet grew up in the Deep South, and as this highly positive review of Coram’s memoir of Deep South reveals, Chet’s appreciation of culture is not limited to Poland. This must-read review just appeared on Chet’s website, Slightly East of New. Way off in the southwest corner of Georgia, where that state, Alabama, and Florida come together, there’s a constellation of small towns that exist only to serve the farms that surround them. Peanut country. Edison is one of them. There were no Interstate highways when Robert Coram was growing up in Edison, and when they were built, the closest was 60 miles away. Television did arrive before the big highways, and on a good day, and with a tall antenna, you could pick up two stations. In most of the rural South, life went on as it had for millennia. Outside of the towns themselves, most people did not have what we call “indoor plumbing.” If you’ve never had the pleasure of using the outdoor variety — yes, they did use the Sears Roebuck catalogue for toilet paper — Coram will fill in this gap in your experience. Coram doesn’t exactly say that he hates Edison, but leaving is all he can think about as he nears graduation from high school. He concludes that the people of the town are just “mean.” This feeling, of course, is hardly unique to the South. In fact, the only uniquely southern event is the scouts from Georgia all taking their rebel flags with them to a jamboree at Valley Forge, PA. Even the dreaded Klan had spread far beyond the South by Coram’s time (Google “KKK Indiana governor,” for example). The vicissitudes of farming are universal, as are parental abuse, underage drinking, discovering sexuality, and driving far too fast on unpaved country roads (I often think about a certain night in Mississippi when my best friend in high school let the left front tire wander a little too far onto a very soft shoulder). The urge to flee the nest will be familiar to most of us, too. We are all scarred, and Gully Dirt is our memoir, too. The South, though, is unique in one big way — the sting and poverty that accompanied losing the Civil War and enduring Reconstruction. Today, hardly anybody south of Dalton can tell you where Chickamauga is, and the decisive battlefields around Atlanta are parking lots. When Coram was growing up, there were still lots of people who remembered their parents’, aunts’, and uncles’, stories of sitting by the fireplace listening to their parents tell what it was like when the Yankees were down here. One of the most popular novels of all times, Margaret Mitchell’s epic of life in the Old South, was published just before Coram was born. And the list of poorest counties in the USA is still dominated by counties in the old Confederacy. Coram’s Calhoun County, GA, is 38th in per capita income, with about half the national average. At first, the red clay of rural Georgia might seem as far from our own hometowns as the red surface of Mars. But as you laugh and occasionally cry along with Coram’s tales, it doesn’t seem so strange. We all grew up. We all did things we shouldn’t have and a few that might have done us in. We all did some things that we had to do but which are not usually written about. We all had to figure out how to approach potential romantic partners and what to do when our partners then go and pick someone else. Although his relationship with his father will remind you of another southern writer’s with the Great Santini, he comes to realize its value, that after a 17-year boot camp wth his abusive retired master sergeant Daddy, the scowl of a pissant sheriff checking up on his daughter is as nothing. Neither is much else in life. At the end of the book, though, Coram finally claims “that cruel, God-struck, sun-blasted corner of southwest Georgia” as his home. He can do no other: The South does not release its children. However despite all this, I suspect that Robert has a soft spot for Edison somewhere. He points out with barely hidden pride that for all its faults, Edison was resolutely NOT anti-semitic, a rare virtue among so many places not so long ago. On his Amazon page, he assures us that “… southwest Georgia remains a big part of who and what I am” for which we can all be grateful. Even his mother didn’t blame Edison or the South for his father’s temper: “It was the Army,” she assured him. Robert Coram is probably best known for his magisterial biography of the late USAF Colonel John Boyd, which fact will explain the pig. He’s also, however, a crime novelist (my favorite is Kill the Angels) and a storyteller in the grand tradition of Faulkner, Pat Conroy, Flannery O’Conner, Willie Morris, Eudora Welty and the list goes on. In this coming-of-age memoir, Coram spins a web of tales, all of which he assures us are the gospel truth. They may well be — Southern towns have provided the grist for many a literary mill. Bottom line: Gully Dirt is a worthy new member of the clan that includes Rick Bragg’s All Over but the Shoutin’ Frank McCourt’s ’Tis, and one might throw in his friend the late Pat Conroy’s The Great Santini and its non-fictional companions. If you liked any of these, you’ll love Gully Dirt. I’ve known Robert since about 2000 when he was working on the Boyd book [CS note - Amazon rating: 4.6 out of 5, 401 reviews, sales > 100,000]. He encouraged me to complete and publish Certain to Win [CS note - Amazon rating: 4.7 out of 5, 39 reviews], and he introduced me to his wife, Jeannine Addams, who gave me a home in her PR agency for the next dozen years. He may be the last of a lineage of tellers of tall tales extending back way past Faulkner to kitchens, parlors, and porches throughout the South, the last because even Edison has the Internet, now.